June 9, 2012 -- ORLANDO, FL - Microsoft's Kinect video game controller is being used to estimate body habitus of patients, with the goal of developing more accurate dose estimates tailored to individuals. A project still in its earliest stages captivated attendees on Friday at the Society for Imaging Informatics in Medicine (SIIM) annual meeting. Kinect attaches to the Xbox 360 gaming console and enables users to control game play using a camera and a microphone. In essence, it is a combination RGB camera/infrared depth sensor device. Imaging informatics researchers at the Hospital of the University of Pennsylvania are using Kinect to help accurately estimate whole-body volume. They plan to use this information to provide CT dose estimates that better reflect a patient's body habitus and to better position patients within CT scanner bores. Dr. Tessa Cook, PhD, a radiology fellow, presented the work undertaken to date and what she and her colleagues have learned from their experiments. There is growing interest in being able to accurately and routinely monitor patient exposure to ionizing radiation. Existing methods of estimating whole-body effective dose provide straightforward, practical ways to estimate radiation exposure to a patient, but they often do not incorporate patient size. For example, research has already shown that dose-length product (DLP) can underestimate radiation dose for small patients, especially children, and overestimate dose for larger adults. "There are many potential estimates of a patient's size, including height, weight, body mass index, and the effective diameter of the anatomy being imaged," Cook explained. "But none of these measures effectively captures the size of the region of anatomy being imaged. We wanted to identify a way to do this rapidly, efficiently, and easily." The Kinect controller does this when an individual stands in front of the camera for several seconds. Software developed by Radimetrics registers a depth map and computes a skeletonization of the person, and the data are used to estimate the volume of the individual. Volume is calculated in real-time while the individual stands approximately 5 ft to 6 ft (2.5 m) from the camera. 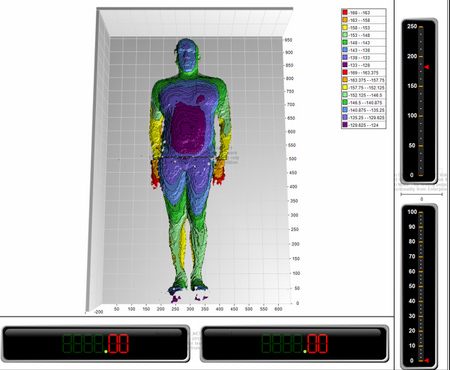 Software developed by Radimetrics registers a depth map and computes a skeletonization of the person, and the data are used to estimate the volume of the individual. Image courtesy of Dr. Gregory Couch, Radimetrics. The hospital's initial test of the Kinect-driven system included five adults -- two men and three women -- ranging in age from 35 to 45. The volunteers were imaged with their hands upright, crossed, and by the sides of their body to estimate whole-body volume. The researchers discovered that using two cameras positioned at a 90° angle to one another provided more-accurate information. They also experimented with patients standing in frontal and lateral positions. The researchers hypothesized that the density of each individual would be close to 1,000 kg/m3, or the density of water, as the human body is primarily composed of water. They determined that the average density for the volunteers was 995.2 kg/m3 when they positioned their arms by their sides, 805.1 kg/m3 when they extended their arms upward, and 1,136.8 kg/m3 when they crossed their arms over their chests. "Whole-body volume estimates can provide information about the thickness of a patient, which is relevant not only to how much dose the patient receives during an exam, but also how much is necessary to produce diagnostic-quality images," Cook said. "While the volume generated by our system is of a patient's entire body, it can be matched to the region of a patient being imaged in order to provide a regional size estimate and, ultimately, more accurate radiation dose estimates corrected to size." More work is needed to investigate the differences introduced by patient height and age, as well as the clothing worn. Baggy clothes and hospital gowns cause differences in measurements. The next step is to image 40 or 50 volunteers and to begin to study pediatric patients. The researchers also intend to determine how volume measurements are affected by patients lying prone on exam tables. Currently, data are not captured, which needs to occur for the information to be utilized. "In another year, we expect to have a lot more to report," Cook concluded.